"We're going to cancel every needless job-killing regulation and put a moratorium on new regulations until our economy gets back on its feet." A campaign rally in Tampa, Fla.
Donald Trump signs legislation rolling back federal regulations on March 27, 2017. By Jana Heigl on Wednesday, April 5th, 2017 at 4:20 p.m.
One of President Donald Trump's oft-repeated campaign promises has been to slash federal regulations, especially the "midnight regulations" that former President Barack Obama passed before he left office. Trump has taken several steps to fulfill this promise. Only a few hours after the inauguration, he temporarily froze all new regulations, until the administration had time to review them. This is not an uncommon move for an incoming administration. Agencies were instructed to withdraw any new regulations they might have submitted. He also signed an executive order that requires agencies to repeal two existing regulations in order to pass a new one. In addition, Trump and congressional Republicans have used the Congressional Review Act, a measure that was rarely used before him, to roll back regulations. The law allows fast-tracked bills for repealing regulations. It dates from 1996 but was was used successfully only once, by President George W. Bush in 2001. Trump, by contrast, has used it a total of 12 times to repeal regulations passed under Obama. Most recently, he signed House Joint Resolution 37, which repeals the Fair Pay and Safe Workplaces executive order. The regulation had required companies that contract with the federal government to comply with stricter labor laws. He also signed House Joint Resolution 44, which repeals the Bureau of Land Management's "Planning 2.0" rule on federal land management. The regulation had allowed the bureau greater control in managing ecological and economic resources. 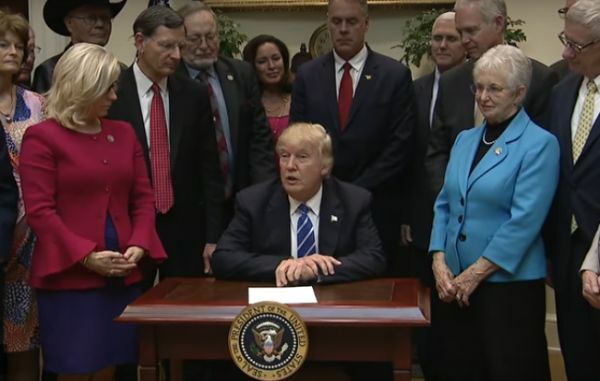 And he signed House Joint Resolutions 57 and 58 to repeal additional regulations on states and local school systems, such as requirements to assess the quality of teacher preparation programs and state plans. Clearly, Trump has eliminated a number of regulations, and it doesn't seem like new regulations are going forward. That said, he had vowed to put a temporary ban on new regulations, and we haven't seen a formal ban yet. Until he does, we rate this promise In the Works.